Biomedical engineers use their understanding of science, medicine, and engineering to create devices, procedures, and materials that monitor and improve human health. Purdue’s Weldon School of Biomedical Engineering (BME) curriculum incorporates engineering fundamentals, design, and analysis, as well as coursework in organic chemistry, biochemistry, biomaterials, bioelectricity, biomechanics, and biological heat and mass transfer. Students gain hands-on engineering experience through intensive lab coursework and by solving real-life biomedical problems. What is your favorite part of engineering? My favorite part about engineering is the versatility of your degree. You learn how to be a technical/critical thinker and an efficient problem solver. The skills you gather are applicable to almost any field in industry and other occupations. What is your favorite class you have taken and why? My favorite class I have taken is a Study Skills Seminar with Miss Brenda Downing. I learned so much about my study habits and how to integrate self-care in my schedule. Every time I left that class, I left with something new to apply to my student-life. My grades improved after taking this class as well! I still use the tactics I learned in that class this semester. What is the best thing about Purdue? The best thing about Purdue is the passion instilled in the staff. I've had wonderful academic experiences with Professors because they communicate how much they care about our success, academic experiences and life after graduation. Professors and other teaching staff have impacted me greatly and encouraged me to become more rooted at Purdue through different avenues other than academics. Tell us about a fun memory about your time at Purdue! When Professor Craig Miller wore my hoop earrings for a lecture! What sorts of things are you involved in on campus? I am a chapter member of the National Society of Black Engineers (NSBE) and on the Regional Board as Region 4 Treasurer. I am on the 2018 ElectHer Planning Committee, and I work in the Minority Engineering Program Office as the Program Administrator. I am also a member of the Biomedical Engineering Society and the Biomedical Engineering Mentee Program. What is the best advice you received before coming to Purdue? Never allow anyone to tell you that you can't do something. You are capable of achieving excellence. What is something you wish you had known when going through the college search process? I wish I had known which AP/ACP Classes transfer for credit. I would have challenged myself more in high school to take more advanced classes! What is some advice you would give to incoming engineering students at Purdue? Always discover what you enjoy early. Finding something you are passionate about will help you realign with your goals when you feel discouraged. 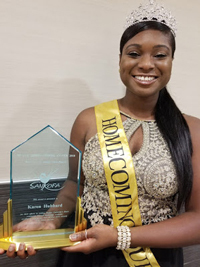 I won 2018 Black Purdue Homecoming Queen!